The reason is quite simple. 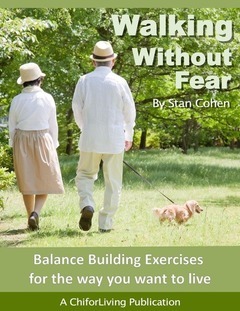 Balance applies to everything we as people do from a standing position. Improving balance changes lives and it saves lives. They way we move is directly linked to being able to lift one foot off the floor without falling. No matter what direction you want to go. Be it forward, backward, to an angle or sideways. The ability to move in balance is also the backbone of Tai Chi form work and is directly tied to most of Qigong. One of my favorite lines is ‘everything you do in life requires some sort of movement and the more fluid you move the easier it is to do any task‘. Apply this to walking as well. The better your balance the easier it it to navigate whatever walking path you take. Stepping up or down from curbing or stairs, carrying a package or simply walking from you bed to go pee at night. It is unfortunate that so many individuals overlook the simple fact that spending a few minutes each day on leg strength and a few simple balance exercises improves their balance, even if it good to start with. Most people wait until they have a fall, have a fear of falling of notice that “wow, I never realized until just now how unsteady I am”. The balance skills I teach addresses many issues, and I see so many people improve and have so many say “thank you” for teaching this, it has changed my life. Yeah, teaching balance is a healthy passion.